Homeownership among people ages 24 to 32 fell 9 percentage points, to 36% from 45%, between 2005 and 2014, the Fed said. While many factors affected the homeowner rate, the Fed said 2 percentage points, or about a fifth, of the decline was tied directly to student debt. That translated into 400,000 borrowers who could have owned a home by 2014 but didn’t because of student loans. The article goes on to point out that the study period for these results (2005-14) corresponded with a sharp increase in student loan delinquencies, and that in ensuing years many borrowers have enrolled in plans that reduce their monthly bills, but there isn’t any hard data yet that shows the impact has been reversed completely. In a study of the 100 largest U.S. cities, 22 shifted from owner- to renter-majority between 2006 and 2016, including key markets Chicago, San Diego, Detroit, Austin and Sacramento, boosting the total number of renter-dominated cities to 42. During these 10 years, the total U.S. population gained approximately 23.7 million people, and at the same time, the number of renters increased by 23 million, and homeowners by less than 700,000. The U.S. homeownership rate rose in 2017 for the first time in 13 years, driven by young buyers who overcame rising prices, tight supply and strict lending conditions to purchase their first homes. The homeownership rate rose to 64.2% in the fourth quarter of 2017 from 63.7% a year earlier, according to data released Tuesday by the U.S. Census Bureau. The share of Americans who own a home has been on the rise since the first quarter of last year, indicating a reliable upward trend. The homeownership rate among households headed by someone under age 35 rose to 36% in the fourth quarter from 34.7% a year earlier. That was by far the largest increase of any age group during the period. Now, the homeownership rate is rising again as millennials begin to embrace homeownership. In all, the U.S. added roughly 1.5 million new owner households in the past year. Meanwhile, the number of renter households declined by 76,000, the second consecutive quarter in which the renter population shrunk on an annual basis. No doubt the apartment industry has been on a heckuva run over the last eight or nine years, but numbers like this must have some people wondering if the run is about to end or at least hit a serious plateau. A number of factors are propelling first-time buyers into the market. Many are entering their 30s, marrying and having children, and need more space than they can get by renting. Credit also appears to be loosening. According to Genworth, about 78% of first-time buyers are using low-down-payment loans, compared with the historical average of 73%. Economists said a wave of first-time buyers is likely coming over the next decade, as a large cohort in their mid-20s begin to buy homes. Considering the size of the Millennial generation, this probably will have a significant impact on the apartment industry. Eventually. Over the last couple of years, we’ve been hearing anecdotes about why young adults aren’t buying homes at the rate we’d normally expect based on historical trends. One of those anecdotes is that young people saddled with student debt are unable to qualify for home loans, thus delaying their entry into homeowner status, but there hasn’t been a lot of data to back that up until now. The report offers a mixed assessment on the effect of student debt on the economy. Student debt, which has more than doubled over the past decade to $1.3 trillion, has risen partly due to an increase in the number of Americans attending college. That has led to higher incomes and, in turn, positioned many Americans to buy homes. But a significant minority of borrowers are defaulting on their student loans and in turn harming their credit and ability to purchase homes, the report shows. Student debt appears to dampen homeownership rates among those with the same level of education, the report said. Would-be homebuyers have been held back by stringent mortgage standards and wage growth that hasn’t kept up with surging home prices. The average household income in June was 4 percent below a record high set in early 2008, even as unemployment dropped to its pre-recession rate, according to Sentier Research LLC. “We’re still suffering the effects of the housing collapse and the financial crisis,” said Mark Vitner, senior economist with Wells Fargo Securities in Charlotte, North Carolina. “We may have another percentage point to go before we see a bottom” in the homeownership rate, he said. Home values have jumped 34 percent since reaching a bottom in early 2012, making purchases more expensive for entry-level buyers. Prices in 20 U.S. cities climbed 4.9 percent in May from a year earlier, the S&P/Case-Shiller Index showed Tuesday. 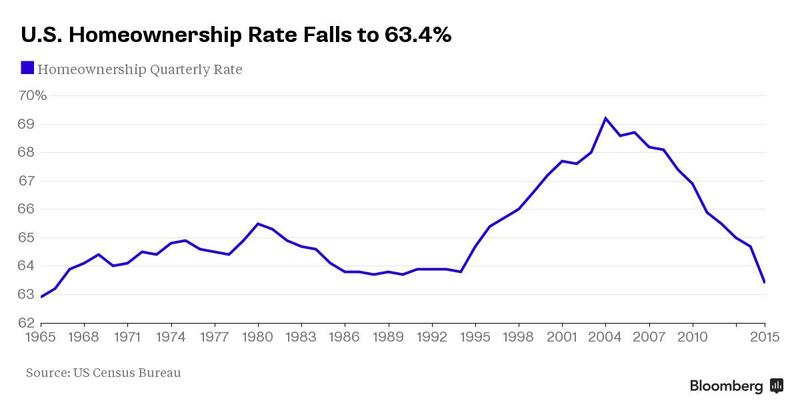 For the first time in more than 20 years, the homeownership rate in the U.S. has fallen below 64 percent, the U.S. Census Bureau has announced. The seasonally adjusted 63.8 percent rate is far below the 69 percent rate just 10 years ago – a time when homebuying may have been the easiest for Americans. Census data shows homeownership rates for individuals aged 35-44 years are falling the fastest – from a high of almost 67 percent in 2009 to little more than 58 percent in 2015. On the same day, the Census Bureau also released rental vacancy rates across the U.S., and the market could not be tighter. The vacancy rate of 7.1 percent during 2015 first quarter, and 7 percent the quarter before, are at their lowest in about two decades. Here’s a link to a chart with showing the ownership and rent data in more detail. The U.S. homeownership rate hit its lowest level since the mid-1990s, according to a Census release that showed that despite two years of recovery in the housing market there are still fewer homeowners than there were before the recession. But the data also suggest that more young people are moving out of their parents’ home and into rentals—a positive first step toward an eventual recovery in the share of households that own their home. Some 64.8% of American families—about 74.4 million households—owned the homes they lived in during the first quarter of this year, down from 65.2% at the end of 2013, according to the U.S. Census Bureau. That was the lowest level since 1995 and is a significant drop from 2006, when a peak of 76.5 million households, or 68.9%, were owner-occupied. One out of every five 25- to 34-year-olds without a job lives with their parents, versus about one in eight that is employed, according to an analysis of Census data by Mr. Kolko. And, indeed, the improving job market for young people is one reason why there has been a boom in apartment construction and rents. The Wall Street Journal is reporting that the homeownership rate has fallen to a 15-year low of 65.4%, while rental vacancies have fallen to 8.8% – lowest since the second quarter of 2002 – and median rents rose to $721/month, the highest since the first quarter of 2009.